All of this freedom to explore in No Man’s Sky is giving me a headache. 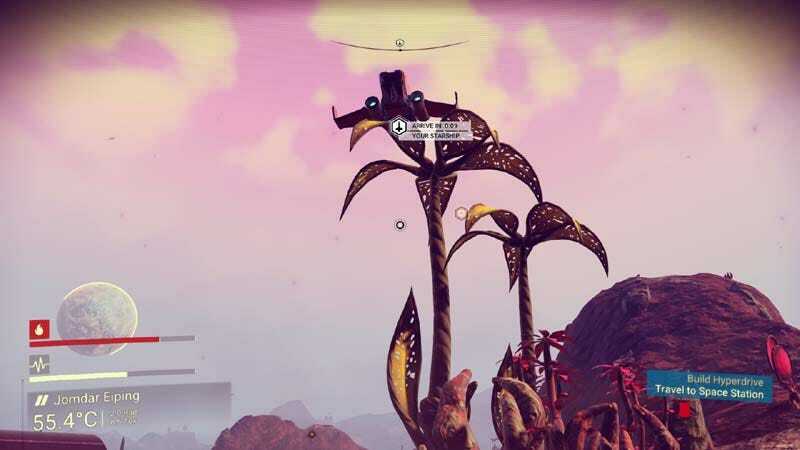 Landing on plant life is one way I’ve been utilizing my time in Hello Games’ space exploration game. As a person who primarily plays linear, story-driven games in the form of JRPGs, the open world of No Man’s Sky has been overwhelming. I’ve played a few before but nothing of this scale. I’ve been enthralled in the past by The Legend of Zelda: The Wind Waker. Sailing the open seas meant stumbling into danger—whether giant squids or storms on the stretch of blue skies coming in as unexpected thrills. Discovering new lands could prove futile, with the random purple rupee as teases. But even so, Wind Waker’s exploration felt rewarding for its exhilarating sense of adventure. Wind Waker felt big yet contained. In No Man’s Sky, boldly going where no man has gone before is an understatement. I decided to give No Man’s Sky a try because I’ve been on a mission to play games I normally wouldn’t. There are things about it that aren’t perfect—entries into planets’ atmospheres makes death flash before my eyes for making me feel as though I have no control, or that I’m heading for a crash landing. I’m an item hoarder, which is a no with No Man’s Sky’s initial inventory limitations. Even with all the freedom in No Man’s Sky, I am still playing it safely. I may have found myself venturing further and living a bit more dangerously but I need direction, and I latch onto it when provided. I need to seek out all the monoliths. I need for the Atlas to tell me where to go and what I should be doing. I could hyper-drive my rickety first spaceship off the beaten path but when I was recently given the option, I still found myself too unsure to take that risk. No Man’s Sky is somewhat like the open exploration parts of many JRPGs—the freedom to explore right before the final boss. During these sections, the world is at your fingertips—usually via an airship. It’s the last minute stuff you could seek out if you want to, such as finding optional bosses or best weapons. Take Chrono Trigger, for example. It’s a game that’s chock full of sidequest content. Before the final face off with Lavos, there are secrets to discover, and pasts to change to bring about brighter futures. A single life could be saved or an entire forest. Navigating Time in the Epoch is one of the richest examples of that specific feeling that comes in controlling your own airship. It’s taking to the skies in celebration of accomplishing so much and being rewarded for perseverance. Sometimes, I enjoy those parts of JRPGs because they’re tiny bursts of uncontrolled narratives. The key word here is ‘tiny’. Those freedoms are limited because there’s the assurance that it’s all going to end soon. No Man’s Sky does almost the opposite. The airship is handed to you at the beginning—in poor condition—and that’s when you’re told to persevere. It also has an ‘end goal’ at the center of its universe. But being an open world game means having the leeway to do whatever the hell I want before getting there. The sheer size is proving to be way too much freedom for me because it lacks a clear assurance that I can control and think of as being tangible. And so I find myself meeting small objectives but feeling as though I’m not engaging in free will. Didn’t I buy this game so I could get away from a strict Point A to Point B method of play? Am I actually doing a lot more exploring than I think? Even when I’m following the Atlas’ directives, there’s still a lot of in-between time of seeking out the oddities of space, right? Is that enough for me? Will I find much more enjoyment if I do seek out adventure elsewhere than the path I’m already exploring? Something tells me I won’t. Another part of me thinks I’m missing out. The next time the Atlas asks me to go somewhere, I might just go in the opposite direction. I’d like to create a narrative of my own as it’s something I haven’t really done before. I’m not even renaming my planets when uploading them for credits, and I don’t feel as if I’m truly leaving my mark anywhere. Eventually, I do think I’ll find myself on the path of the Atlas once more—No Man’s Sky wants to tell a story of its own with the abundant teases of monoliths and language stones (one that may ultimately not matter). And I know I’m missing the point by getting weighed down by the finer details of routine—worrying about what I need to find versus the brilliant things I may just inadvertently discover. I’ll keep trying to detach myself from a particular mindset. Truthfully, I’ve been thinking about this a lot and I’m getting better at it. I want my own experiences to be meaningful—I want to discover what others already have. At the very least, I have unsettled business to take care of in my ongoing war with the flora, anyway. I’m going to keep at it.